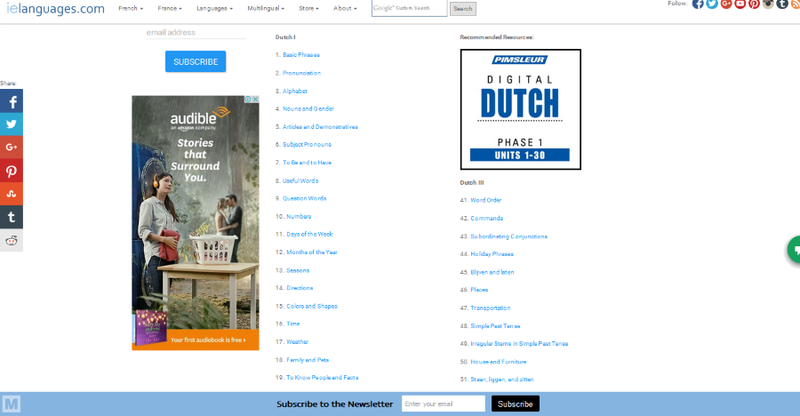 Here is a list of best websites to learn Dutch online. Are you wondering How to learn Dutch language for free? or, are you confused about the Best way to learn Dutch? Worry no more, these websites are absolutely free, and have the best resources to learn Dutch online. It does not matters if you want to begin learning Dutch from the basics, or if you are an intermediate or advanced learner. You will find all you need once you go through the list. Dutch is West Germanic language, mostly spoken in Netherlands. More than 23 million people speak this language, all over Europe. 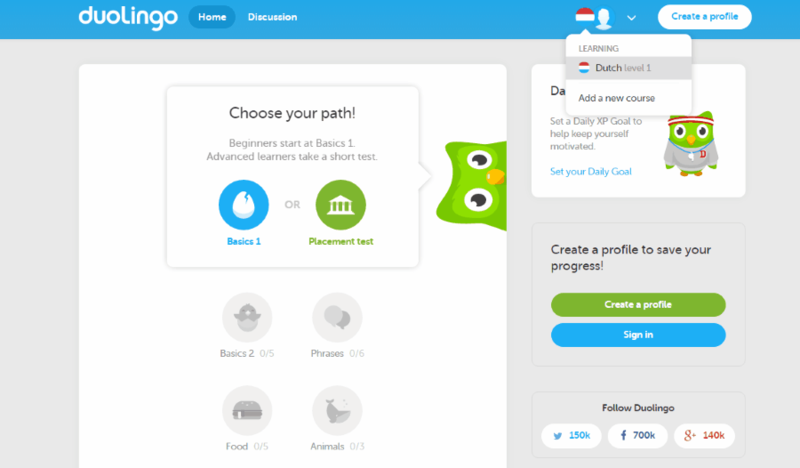 Duolingo is a multiple language learning website which is one of the best place to learn Dutch. It takes you through different levels, and lets you learn Dutch step by step. You can also checkout the list of websites to learn French Language, German Language, and Russian Language. Learn Dutch online for free at Duolingo. 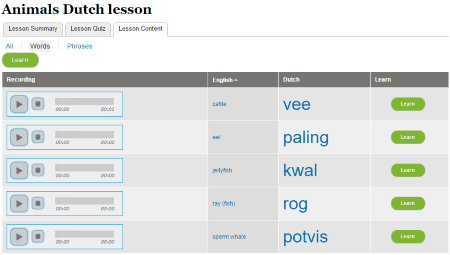 This multiple language learning website provides a full fledged course to learn Dutch language. This platform is apt for beginners and advanced learners of Dutch language. Either you can begin learning Dutch language from basics, or you can take a Placement Test to get placed at a perfect level for you. There are various levels that you will go through while learning Dutch here. 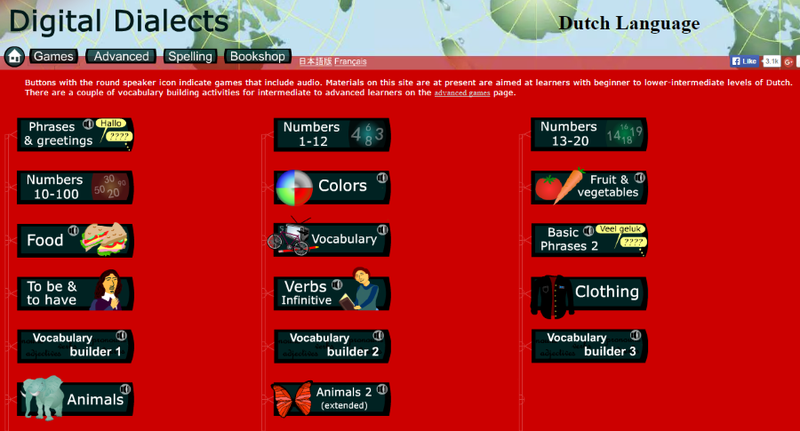 Each level has various modules to teach you Dutch vocabulary, phrases, sentences, etc. Take tests and move on to advanced levels. Sign in to Duolingo to keep a track of your progress. This audio supported Dutch language course also helps you with pronouncing Dutch words perfectly. 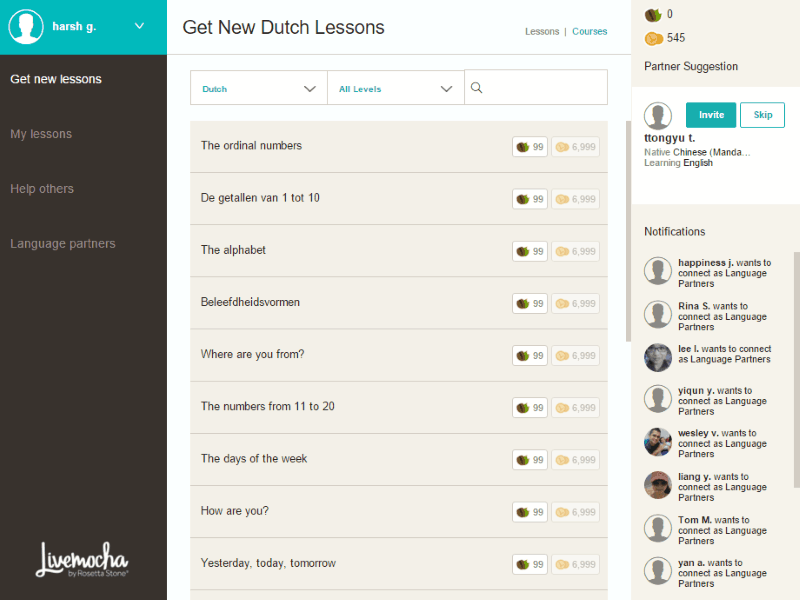 Livemocha is a language learning portal where you can learn Dutch language. The Dutch language course is supported by audio and video playback. 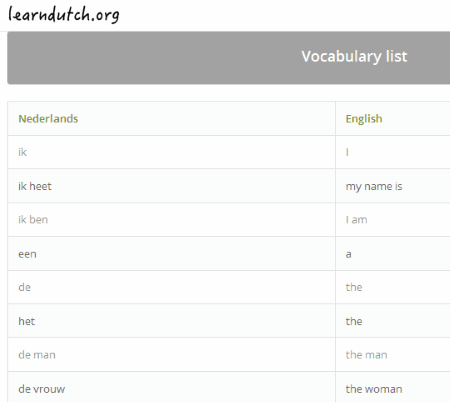 Begin to learn Dutch with Dutch Alphabets, Numbers, Phrases, and their Pronunciations. 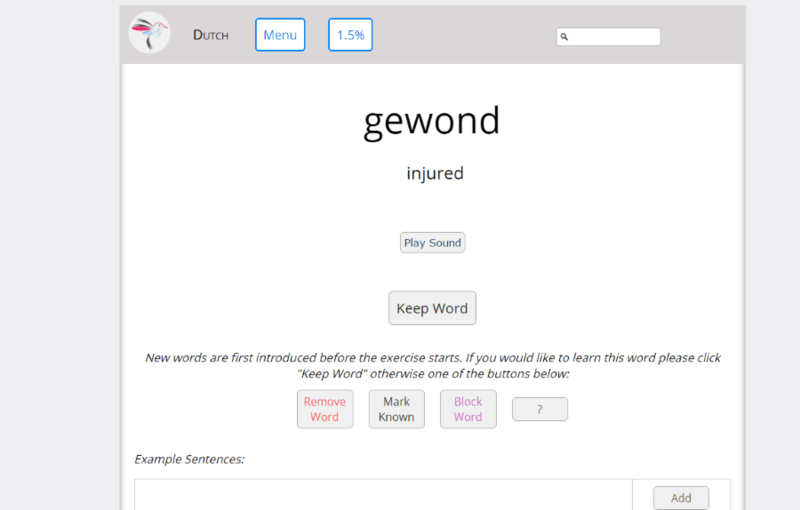 You can move to advanced levels to learn Dutch Vocabulary, Grammar, and Sentence formation, once you are done with basic lessons. With the help of this free online Dutch learning course, one can get hold of this language pretty quick. Unlock lessons with coins, you get these coins at the time of sign up, and you may also earn coins while learning lessons. Learn Dutch for free online at Loecsen. 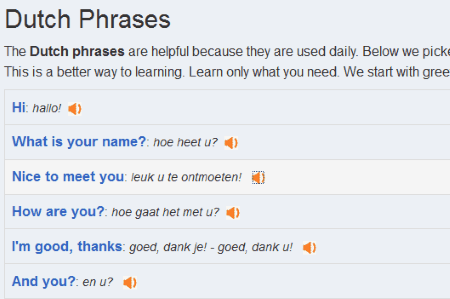 Start learning Dutch language with the help of various conversational phrases. The Dutch language learning course is divided into various sections. These sections are divided based on the situations you might face while you travel to a place where Dutch is spoken. These sections include Dutch numbers, colors, essentials, at a hotel, at a bar, at the airport, etc. 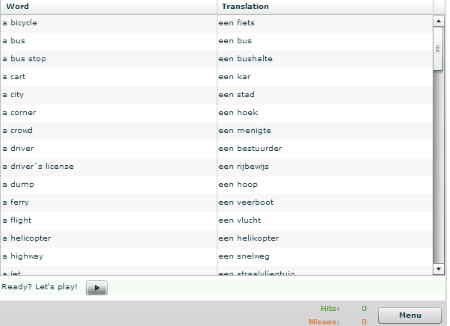 The audio playback lets you learn the actual Dutch pronunciations. PDF and audio can be downloaded to your computer to learn Dutch on the go. 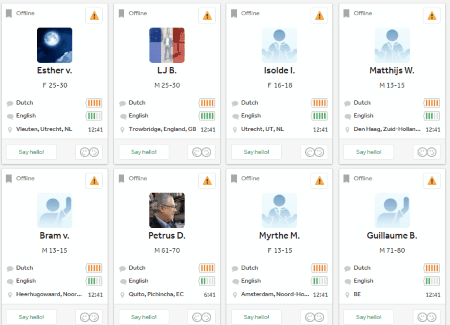 Digital Dialects is another multiple language learning platform which offers online Dutch language learning option. There are 17 different modules to learn Dutch in this Dutch language learning course. Through these modules you will learn Dutch phrases, numbers, vocabulary, time units, grammar, and much more. 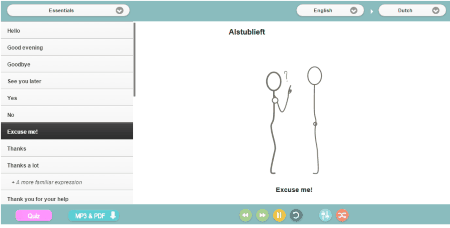 Audio supported modules let you learn Dutch pronunciations easily. 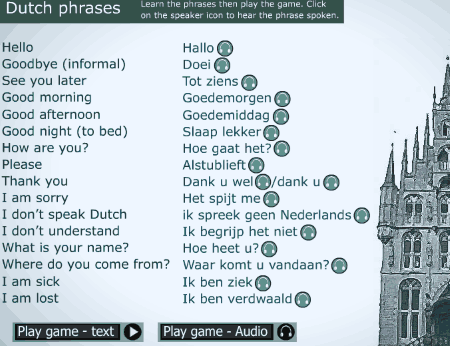 Dutch language learning games are added advantage for quick learning. 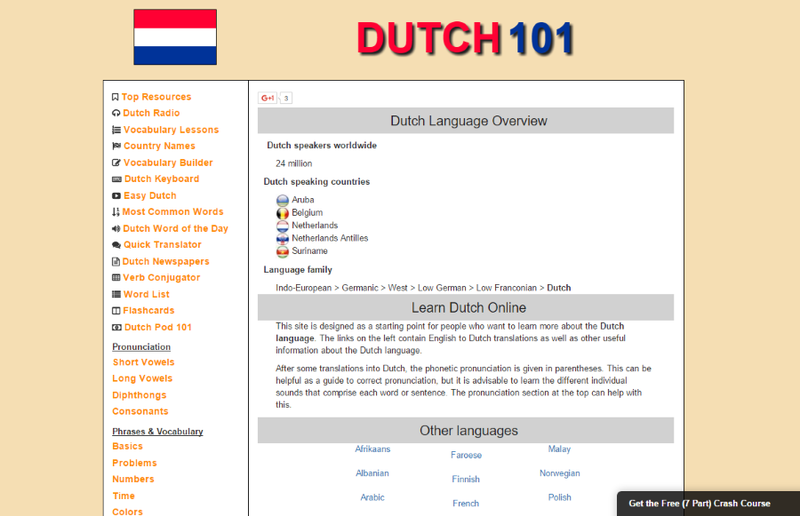 Zeer Goed Dutch is another free website to learn Dutch language online. Start learning Dutch language with the beginners module, and move to Intermediate, and grammar modules. You will also find a course here which is specially designed for travelers. These modules are further divided into various lessons. Learn Dutch alphabets, number system, vocabulary, pronunciation, phrases, etc. Learn the advanced lessons after finishing the basics. This website is fully supported with audio playback. iLanguages is another free multiple language learning website, where you can learn Dutch online. 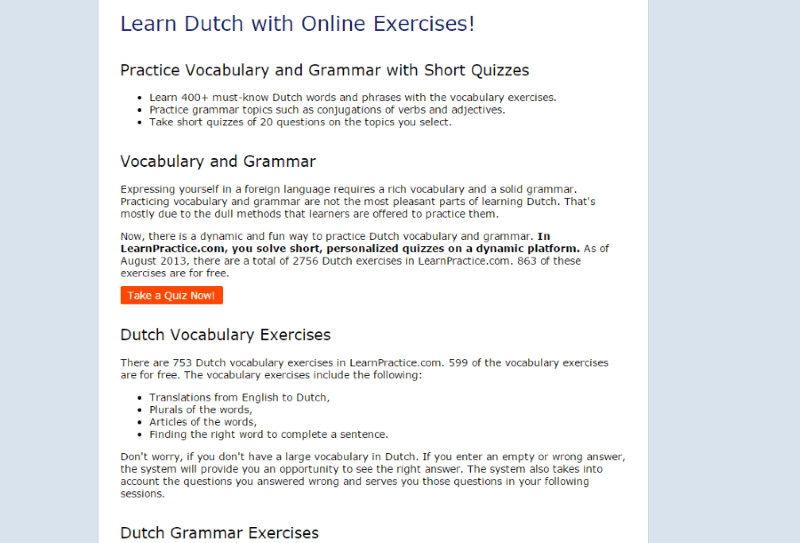 Learn from different modules which will teach you Dutch vocabulary, phrases, and grammar. Check out the Flashcards and Quiz section to practice. Supported by audio playback, the modules will teach you to pronounce Dutch perfectly. This is a perfect place to build a good base in Dutch language. Learn to speak Dutch for free at Goethe-Verlag. With 100 lessons to learn Dutch language, this is a perfect place for beginners who are learning Dutch. 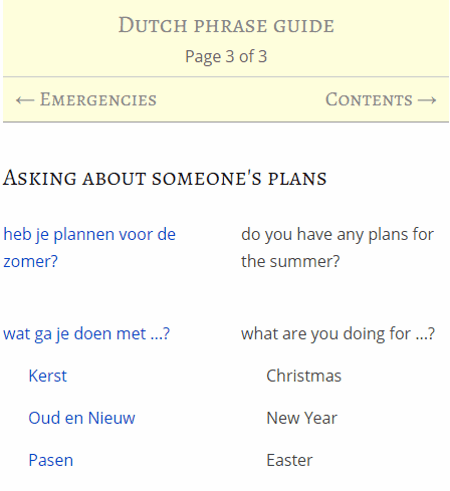 These Dutch lessons have Phrases that are used at various scenarios and places. 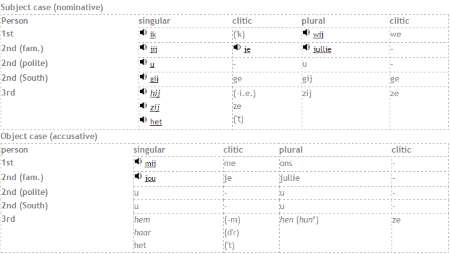 You can also learn Dutch grammar here. Completely supported by audio, this website helps you with learning Dutch pronunciations pretty quick. 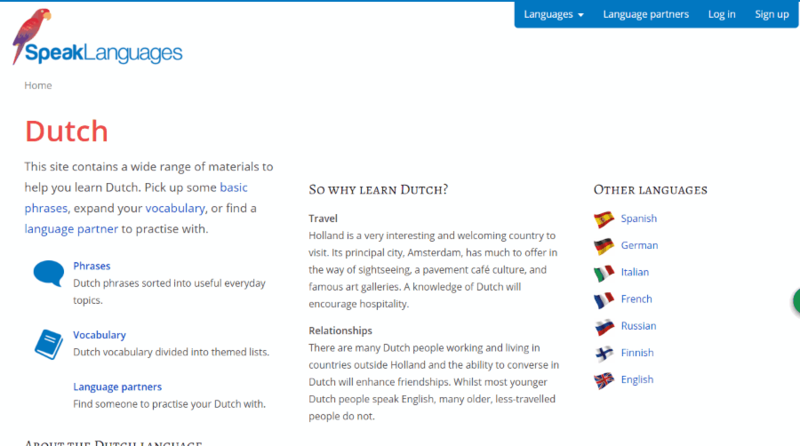 LearnDutch.org is a dedicated website to learn Dutch for free. Find 40 lessons here, fully supported by audio and videos. 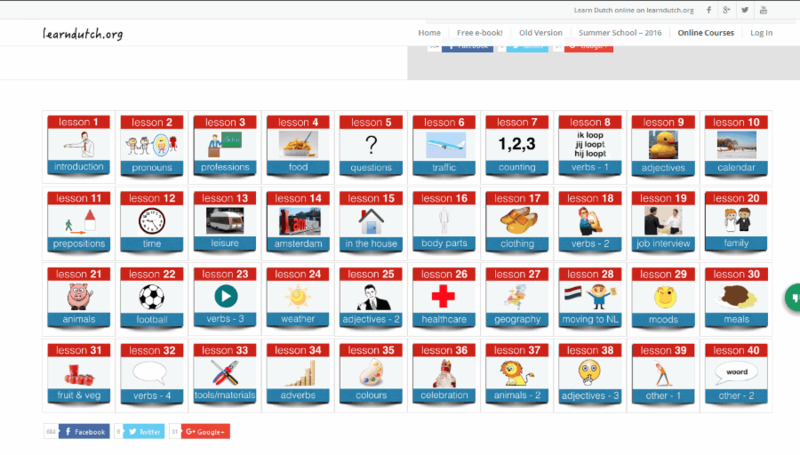 Each lesson has tutorial video, and a list of vocabulary with examples. These lessons begin with basic introduction of Dutch language, and move on to advanced level, like Verbs, Moods Adjectives, Adverbs, etc. Introduction: This is the homepage of the website. It welcomes you with some text, and an introduction video. Beginners: Divided into 10 lessons, this module helps you with building the basics of Dutch language. Intermediate: Move on to this module when beginners module is complete. It has 10 lessons in advanced Dutch. Extra: Learn Pronunciation, numbers, colors, food, etc. Theory: Learn how to use pronouns, construct sentences, and much more. 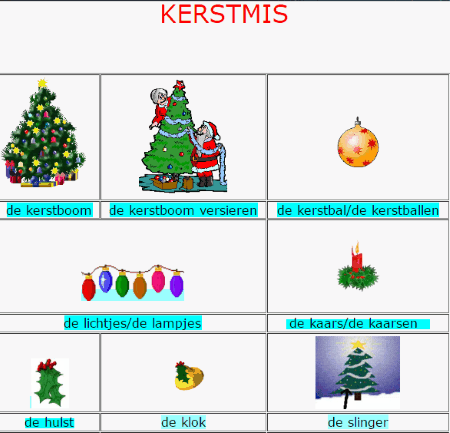 Verbs: Learn various types of Dutch Verbs, and their general usage. Tests: Take the beginner and intermediate tests. You can also take other tests that are available to brush your skills in Dutch language. 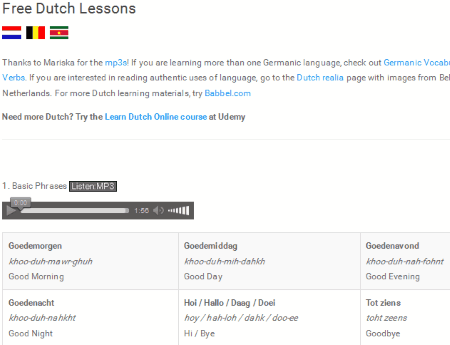 The lessons to learn Dutch language on this website are embedded with audios and videos. 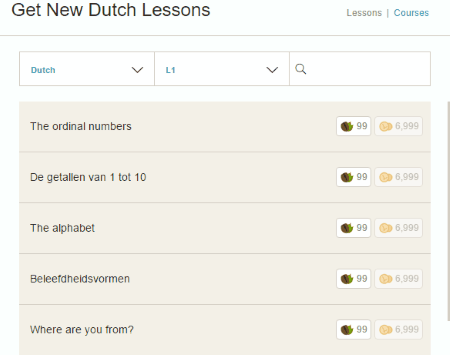 You can find 70 lessons to learn Dutch language at ieLanguages.com. 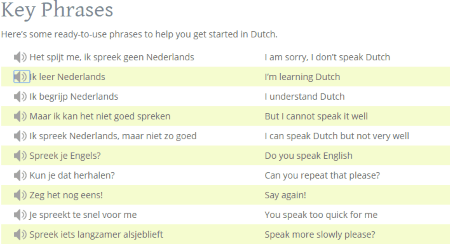 With audio support in these lessons, Dutch is really easy to understand. Learn basic Dutch Phrases, Conversations, Grammar, Pronunciation, Advanced Grammar, etc. with examples. Enter a lesson, and begin the audio, the audio is in sync with each module. You can pause and repeat the audio whenever you want. SpeakLanguages is a free resource to learn Dutch. 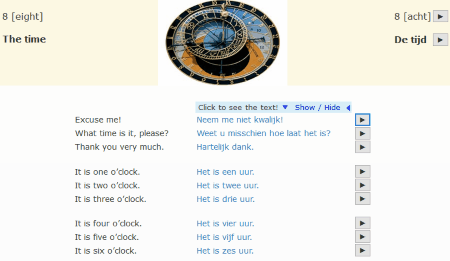 Learn Dutch Phrases and Vocabulary on this website. You will find various lessons divided into categories, like: numbers, colors, family, days, etc. This is a learn at your own pace Dutch course. 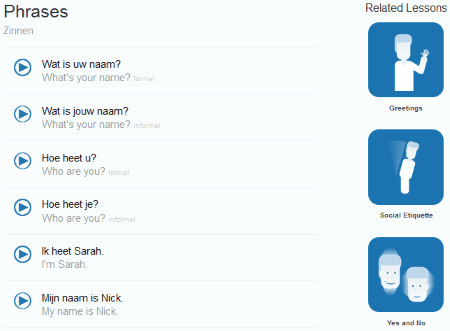 Go to the Language Partner section which lets you select a friend who knows Dutch language. Interact with the person, and learn more about Dutch. Learn Dutch language for free at ToLearnFree. 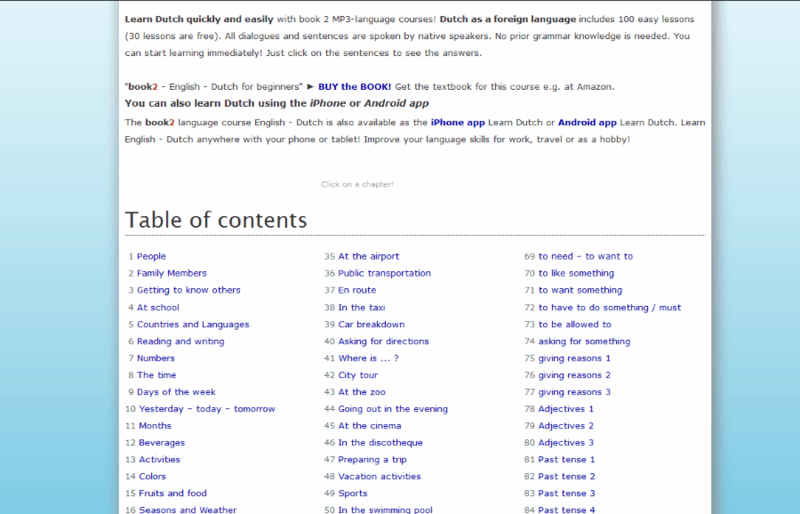 Learn Dutch online from 50+ lessons on this language learning portal. You can take a Placement Test to evaluate your knowledge in Dutch language. Begin learning Dutch with Dutch alphabets, numbers, and vocabulary. When you have learnt the basics of Dutch, move on to Dutch grammar, phrases, sentence formation, pronunciation, etc. Look out for exercises and quizzes to polish your Dutch language skills. Free Dutch Project is a website, totally dedicated to Netherlands. One of its section offers free Dutch language learning course. 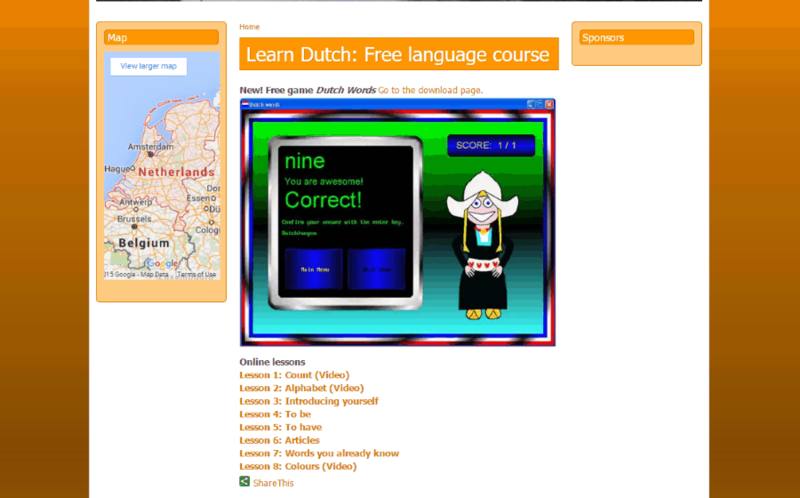 The Online Dutch lessons are divided into 9 parts. Learn Dutch numbers, alphabets, introduction, colors, articles, etc. through these lessons. Few of these lessons have video tutorials as well. This is an apt resource to learn basics of Dutch. Learn Dutch grammar and vocabulary for free at Learn Practice. You can take help of online, as well as offline exercises to learn Dutch. There's a huge list of vocabulary, and grammar lessons in the tutorial section. Take quizzes, and watch video tutorial available here for a better hold in Dutch. 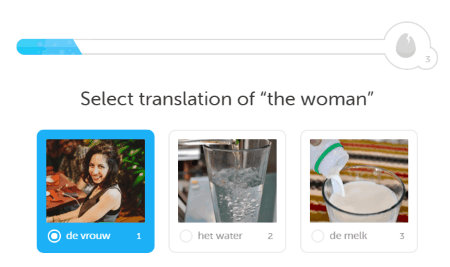 Wespeke is an innovative online language learning platform where you can learn Dutch. Find someone and chat to learn a language. 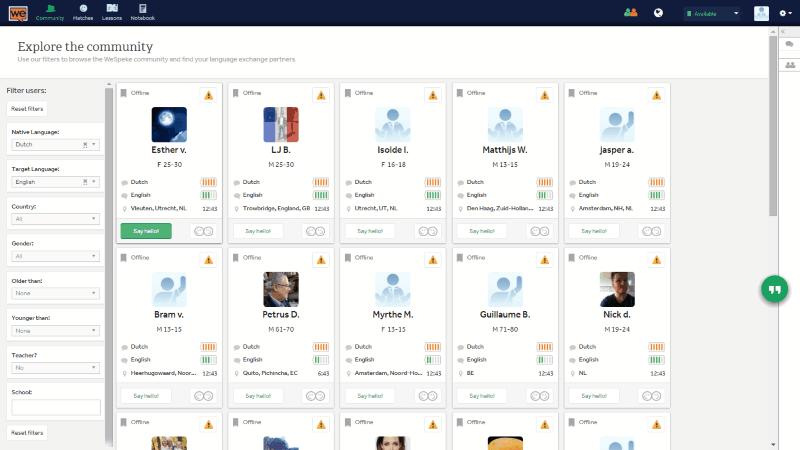 You have to set filter for a language you want to learn, your native language, age group, country, etc, and Wespeke displays members according to your preference. Select any online member, and begin to chat. Add the members as friends to your profile. 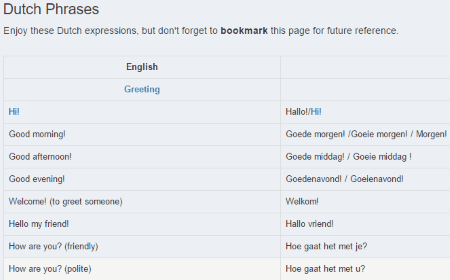 This is the best, and an interactive way to learn Dutch online. Learn Dutch language at LearnWithOliver. All you have to do is, set a level of knowledge in Dutch language, and start learning. 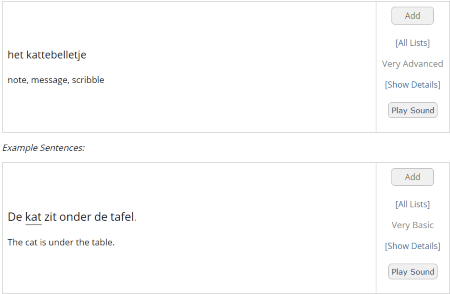 This website lets you learn Dutch vocabulary and phrases. The audio playbacks will teach you actual Dutch pronunciations. You will face various words and phrases with different levels of difficulty. Practice and build up a base in Dutch with the help of exercises available. 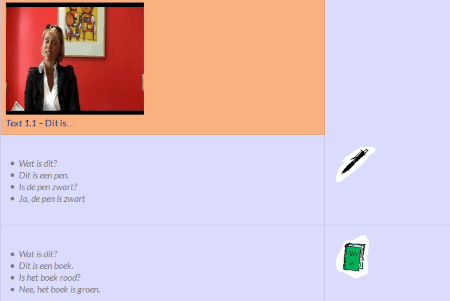 SpeakDutch.nl is another resourceful website to learn Dutch for free. The Dutch course is divided into 3 different modules. 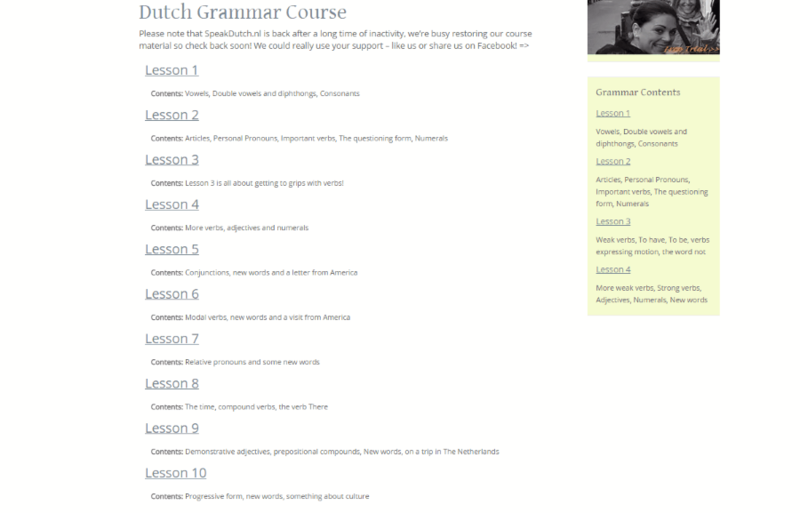 Grammar Course: The module has 11 Dutch grammar lessons. Each lesson teaches Dutch grammar in a very fantastic way. The lessons cover basics to advanced Dutch grammar. Key Phrases: Learn, understand, and know to pronounce some key Dutch phrases. A list of phrases are present in this module along with audio playback. Useful Words: This module is nothing but vocabulary section. Its divided into 4 parts: General, Fruits & vegetables, New year's eve, and Romance. eLanguageSchool is a multi language learning website to learn Dutch online. 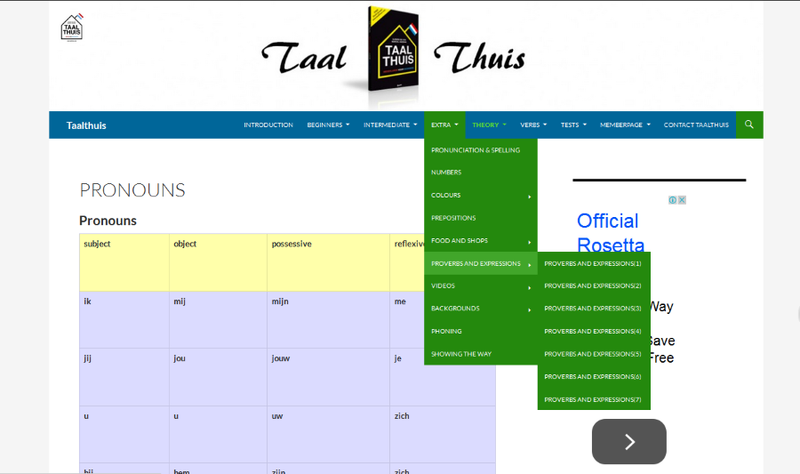 This website provides resources like: Dutch Grammar, Words and Phrases, and Tutorial videos. Build up your Dutch vocabulary, and learning to pronounce Dutch perfectly. 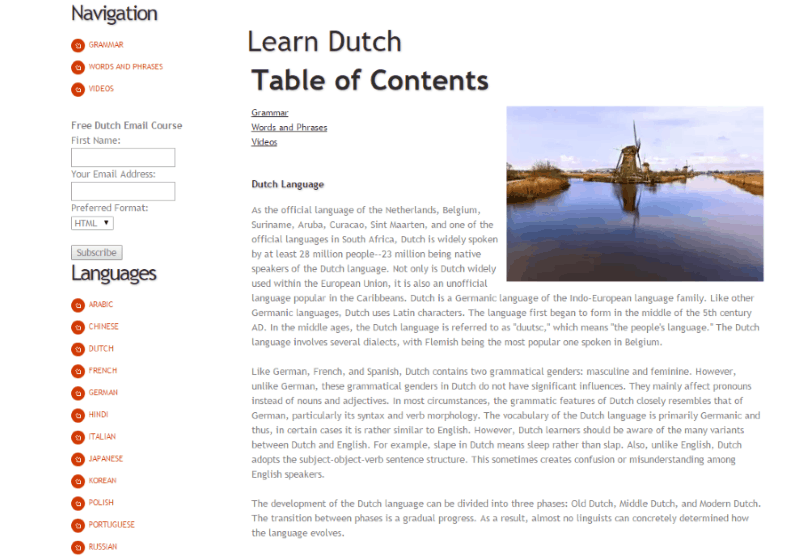 Read the introduction of Dutch language and its history available on the homepage before you begin the course. 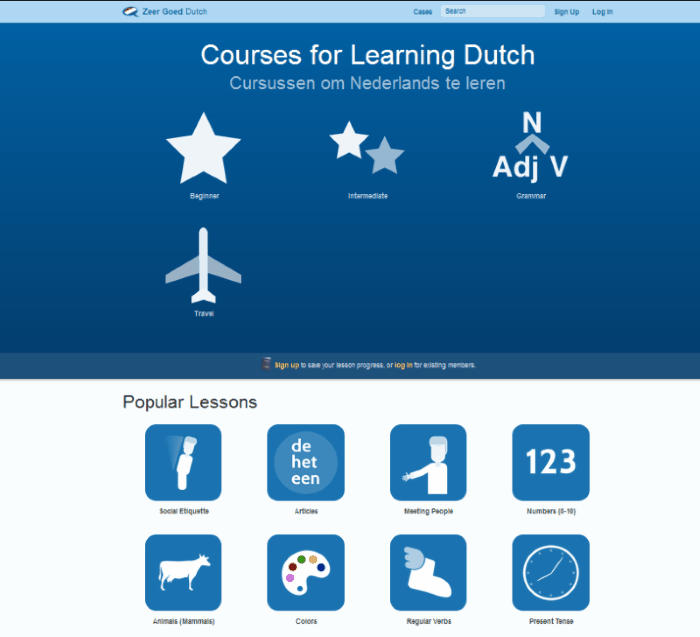 Learn Dutch online at MyLanguages, which has 40+ lessons to teach Dutch. Learn basic as well as advanced Dutch here. 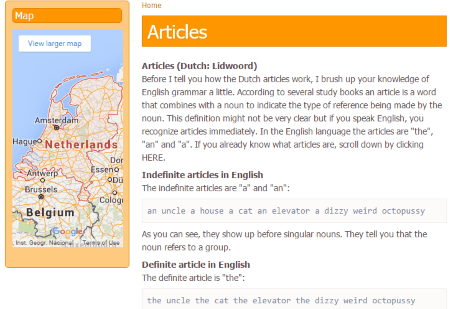 Lessons available on this website are: Dutch Alphabets, Phrases, Numbers, Grammar, Vocabulary, Nature, Food, Places, etc. All of the lessons are supported by audio playback. Other language learning tools, like Dutch keyboard, videos, quiz, radio, and transliteration can be found here. 101Languages has free material to teach Dutch. 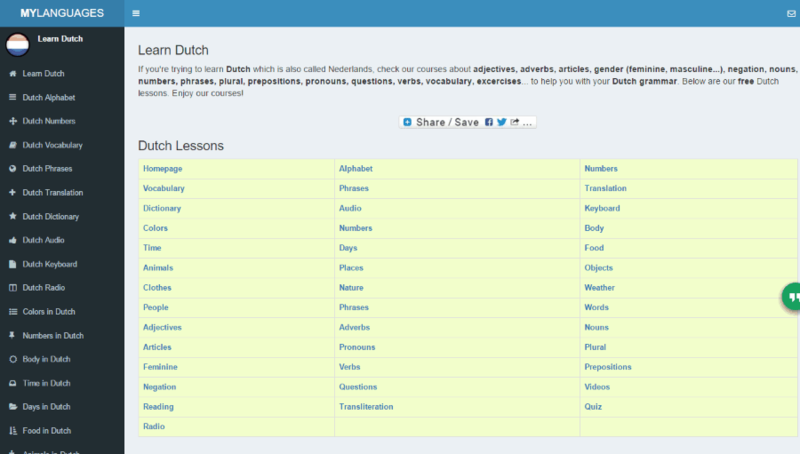 This website has more than 30 modules to learn Dutch language from. 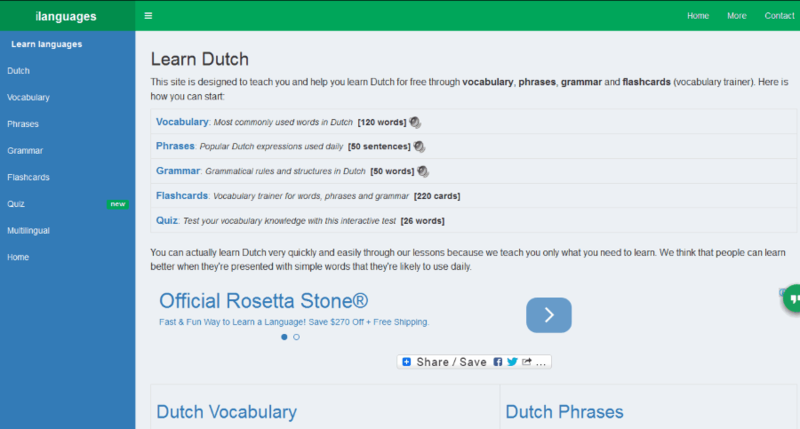 You will find Dutch lessons, vocabulary lists, and language tools. Learn to pronounce Dutch Alphabets, Words, and Phrases. The vocabulary and phrases modules include topics such as: Time, Transportation, Money, Eating, Bars, Shopping, etc. Language learning tools like: Dutch radio, Vocabulary games, Dutch keyboard, Quick translator, Flash card, etc. are also available for free. 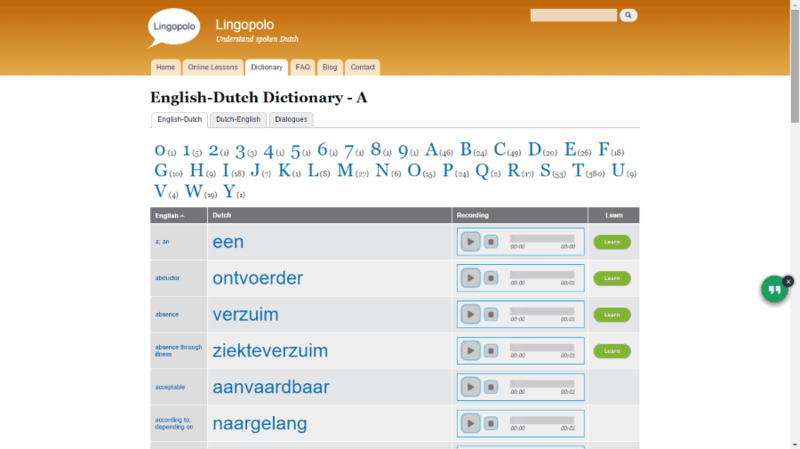 Lingopolo.com is a fantastic language learning website to learn Dutch. The course is based on quiz. It has a vast collection of Dutch vocabulary and phrases. There are 100+ quizzes available here to teach you Dutch. All you have to do is, play the quiz and guess the correct answer by listening to the audio playbacks. Various situation examples and grammar lessons help you with learning Dutch in better way.